VAIL — Camp Hale was a brutal birthplace for the 10th Mountain Division. Back in 1942, when the camp was built, the U.S. Army was trying an experimental and risky initiative in recruiting skiers from all across the country and training them for winter warfare on rugged, mountainous terrain. The altitude, weather and topography combined for a training environment as harsh as they come. It was that experience training at Camp Hale that hardened the men of the 10th Mountain and prepared them to go helmet to helmet with the Nazis in the Italian Alps. While the division was eventually rebased three years after Camp Hale opened, the camp’s legendary story as the birthplace of the 10th and recreational skiing in the Rockies is preserved at the newly reopened Colorado SKi & Snowboard Museum in Vail. Rep. Jared Polis visited the museum Thursday, Aug. 9, to see how its $2.6 million transformation turned out, as well as to promote passage of the Continental Divide Recreation, Wilderness and Camp Hale Legacy Act. Polis introduced the bill in Congress to designate Camp Hale as the nation’s first National Historic Landscape. The act would also protect 98,000 acres of surrounding wilderness in Eagle and Summit counties. 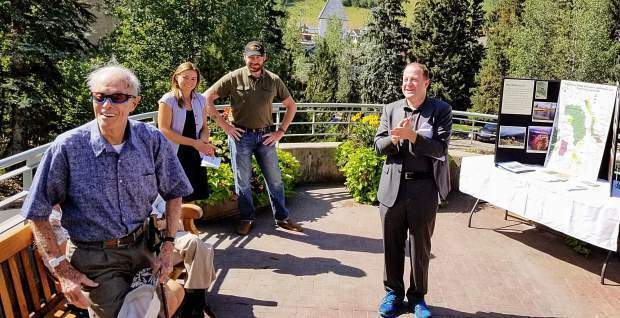 “This is to thank you for your service in the war and the incredible contributions you and other men of the 10th Mountain made in creating what is essentially the entire economy in Western Colorado,” Polis said. Also on hand to speak in support of the act was Garett Reppenhagen, an Army veteran who served as a sniper in Iraq and Kosovo and director of the Rocky Mountain Vet Voice Foundation. Reppenhagen spoke about how protecting public lands and America’s wilderness was one of the things veterans such as he and Treat fought for when they were deployed overseas. After the speakers finished, Treat, 95, gave Polis a personal tour of the snowsports museum. While showing Polis artifacts from Camp Hale and World War II, Treat expressed an earnest desire to see the act passed.